The AVB Switch is MOTU's five-port Ethernet hub that will turbocharge your audio and video network. Audio Video Bridging (AVB) is the exciting new IEEE 802.1 extension to Ethernet specifically engineered for real-time, low-latency, fully synchronized streaming of audio and video over Ethernet. AVB fulfills the promise of a true A/V standard that brings together the worlds of networking technology and professional audio/video. The MOTU AVB Switch allows you to quickly and easily build an AVB-compliant audio (or video) network, with five 1GB AVB ports for ant AVB devices (even other switches), plus an extra sixth port for bridging to a standard Ethernet network. Enjoy the many benefits of AVB, including plug-and-play operation, guaranteed quality of service, and self-regulated network resource management. Connect MOTU AVB devices with standard shielded CAT-5e or CAT-6 cables and go. 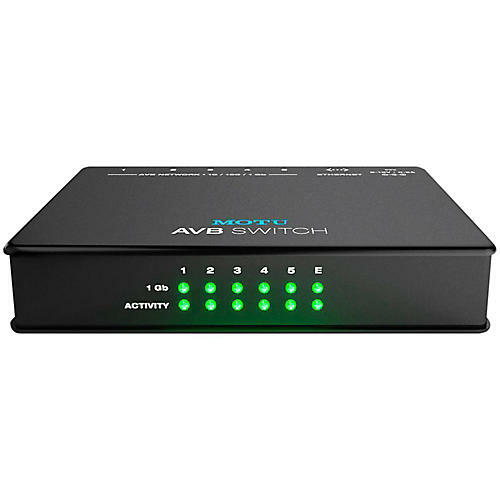 The MOTU AVB Switch supports automatic device discovery and network bandwidth management among connected AVB devices. No IT expertise required. Use standard CAT-5e or CAT-6 Ethernet cables up to 100 meters long between the MOTU AVB Switch and other AVB devices and switches. 1-Gigabit operation means you make the mosr of what AVB has to offer, with very high audio channel counts and very low network latency. AVB provides a network-wide time base for better-than-sample-accurate phase lock across all connected devices. Timing accuracy is down to the nanosecond. In a MOTU AVB system, network-wide sync can be established with one click. AVB can coexist with standard ethernet, for connecting standard ethernet devices like Airports or other Wi-Fi routers, Ethernet hubs, and even entire Ethernet networks in your home, office or studio. Any of the ports on the MOTU AVB Switch support standard Ethernet. A sixth port is provided for standard Ethernet only, so that you don't have to use up one of the five AVB ports for standard Ethernet duties.